It isn’t easy living with any form of Diabetes. As age old saying goes “Prevention is always better than cure”. So the question is how one can prevent Diabetes??? The objective is to keep the sugar out of the bloodstream and push it into the body cells with the help of Insulin produced by pancreas in our body. If you are successful in achieving this day in and day out with every time you pump food into your body, Yes, Diabetic could be kept at bay. Diet alone will not help. It has to be a combination of good lifestyle, healthy food habits and learning to keep your nerves cool. The idea is to sweat and get your heart beat up. Abdominal and Aerobic exercises in particular will help you reduce and maintain your glucose level in the blood. Get your walking shoes on, pull on your sweat shirt and just walk. Exercise and workouts not only helps you to keep your sugar level under control, but does wonders to your physical and mental health in the long run. How to keep your taste buds under control? Remember all that tastes good is not good for the body. It only satisfies your taste buds, but in the process has done enough damage to the rest of the body. By choice cut down on refined sugar and refined carbohydrates food that our body is quick to process and spikes our blood sugar levels unhealthily. Avoiding regular consumption of high glycaemic index food items will do magic to the human system. Choosing the right carb is the key. The complex food items such as Vegetables, whole grains and Natural Fruit sweet, digest slowly resulting in less fat accumulation and help in maintaining a steady blood sugar. Any situation that tends to change the control you have over your body and mind is stress. It can be Physical or Mental stress. In the process to fight stress, body utilizes stored energy – fat and glucose. A body that is sound both physically and mentally will relax quickly. If you find yourself prone to come under the influence of stress, you are prone to be stress diabetic soon. 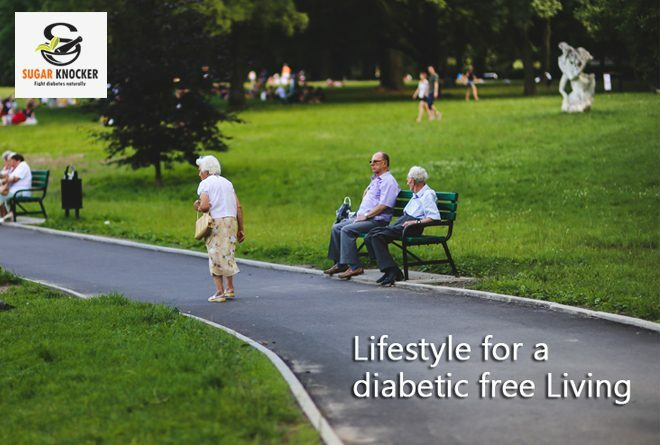 The key to prevent diabetes is to choose a life style with a good mix of exercise, food habit and stress management and a good herbal supplement can help you in achieving this balance. 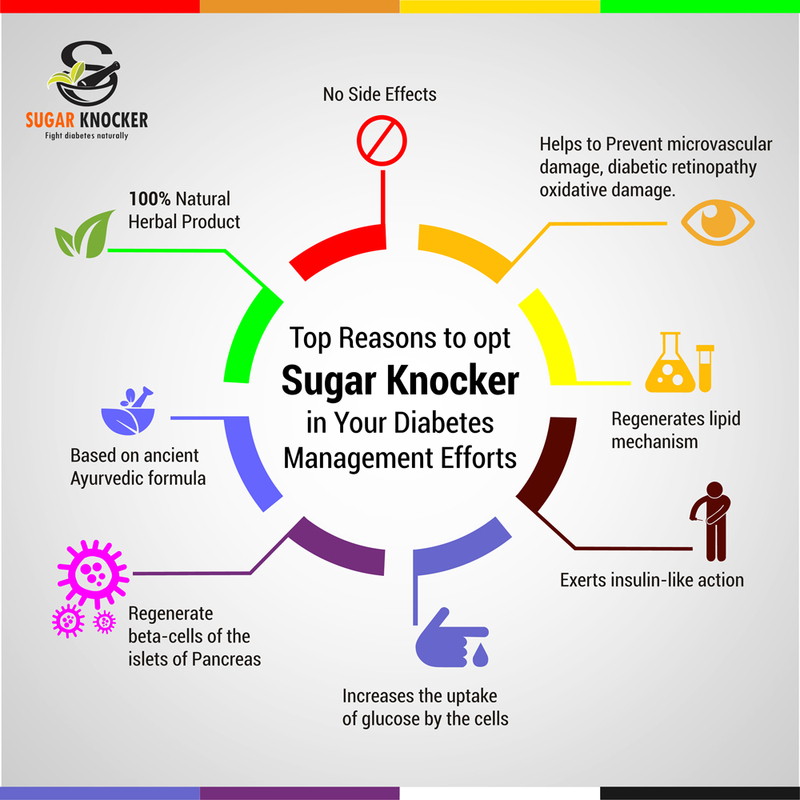 Sushrut Ayurved and ISO certified company provides Sugar Knocker an excellent natural supplement to control and prevent Diabetes. It is prepared using 11 natural herbals and can be consumed along with other medications without any fear of side effects. Remember, Better late than never. Lead a quality Life; Lead a Diabetic free life!!! Bring about the changes in your life style and stay healthy. To Regulate Your Blood Glucose Naturally, Opt Sugar Knocker and Find Better Results by Incorporating Simple formula "Aahara-Vihaara-Aushadhi"